FDC Servers Review 2019: Is FDC Servers a Good Hosting? FDCServers offers a variety of customizable VPS and dedicated server solutions with 99.995% reliability and a 10Tbps backbone. Whether you have a smaller business and are looking for semi-private hosting or a large organization needing a powerful dedicated solution, FDCServers can help you design the right solution. FDCServers has been in business since 2003 and offers a wide variety of web hosting and private server services. While they don’t focus exclusively on web hosting, they do provide reliable options for those looking for VPS and dedicated server solutions. They presently host 13 data centers with over 10,000 customers and boast both a 10Tbps backbone and 99.995% reliability. FDCServers provides a wide variety of customizable VPS and dedicated server options for almost any budget. 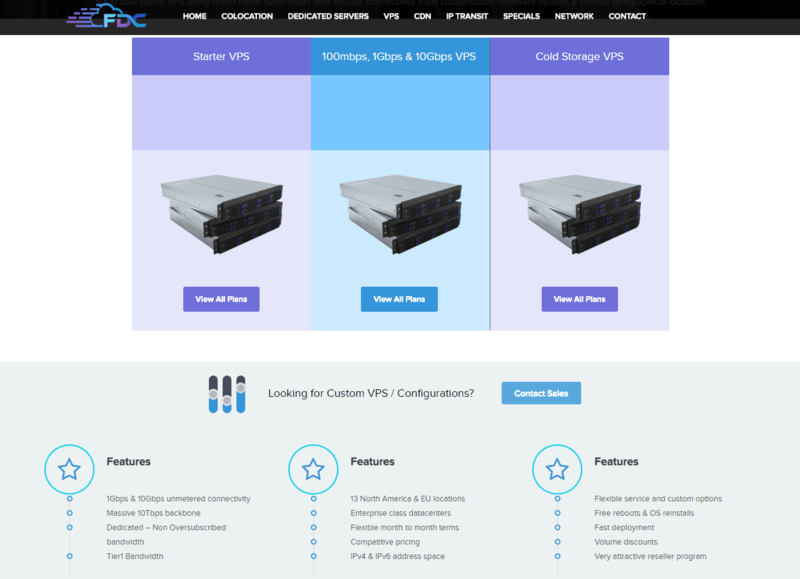 Many companies offering VPS give you a limited number of customizable options for your server. FDCServers gives you over a dozen customizable server options for every plan offered. The main criticism of both the FDCServers’ VPS and dedicated servers is that some lower tier plans have restrictions on their dedicated bandwidth. Depending on the number of sites you’re hosting and the traffic they require, you may be forced to start with a more expensive plan to guarantee your bandwidth. If you’re a beginner who needs a lot of help setting up your website, don’t bother choosing this service unless you plan to hire someone to set up and administer it for you. FDCServers merely sells you space, and that’s all. They don’t offer any support outside of setting up the operating system for your VPS or dedicated server. If you know what you’re doing, you shouldn’t have any issues using their VPS or dedicated servers. Starter – There are four Starter VPS packages that offer between 5 and 100Mbsp unmetered bandwidth along with storage from 10GB to 100GB on a single core server. These plans are most appropriate for smaller sites or groups of sites that don’t need massive bandwidth or storage. Enterprise – Enterprise VPS packages offer anywhere from 100Mbps to 10Gbps unmetered bandwidth with 100GB to 600GB storage and up to four CPU cores. This is appropriate for most small to medium sized websites, and even the top tiers are remarkably affordable. If you need cold storage for website files or records, FDCServers also offers cold storage VPS services with up to 4TB in storage. FDCServers offers three different dedicated server configurations featuring Dell or Supermicro servers. Each server can be customized based on your individual needs with options to choose your data center, the type of bandwidth plan you want, your OS, and optional backup storage. The biggest criticism against their dedicated server setup is that most server configurations come with a setup fee that’s actually higher than your first month’s service. Another criticism of this company is their customer support. The website states that customers will receive a “24/7 helpdesk” link to use once they sign up. What they don’t tell you is that this link is email only. There are no options for phone or live chat support. Also, their support is limited to network and hardware issues only. If you have a problem with your site, you’re on your own. If you’re looking for a VPS or dedicated server provider that’s affordable and gives you customizable features, then FDCServers will fit the bill. This is a service perfect for those that want to manage their site without interference from their hosting company. Wondering how FDC Servers stacks up against other Web Hosting companies? Enter any other Web Hosting company and we will give you a side-by-side comparison.